Here is my finished Pineapple top - this is the second Pineapple I've done in last few months - OK, I'm obsessed! Note there are 2 separate blocks in this version. Contrary to general opinion, this is NOT a difficult block at all, IF you use one of the wonderful rulers available. The border was 3 separate strips, each one slightly wider, resulting in corners that look like an extension of the blocks. It's 72" x 80". Tomorrow, off to my LQS for batting. 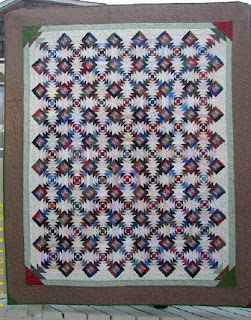 If the centers are all light, the entire quilt has a lighter appearance. I LOVE the spool-like features at the corners. I've used this border on another Pineapple quilt (below, years old, and PP'ed) - it seems exactly what was needed for a border. 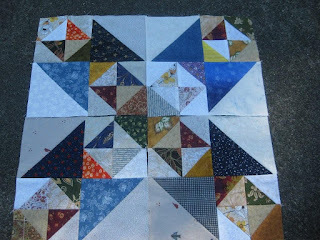 New subject -- below is a photo of blocks I've saved for years, kinda remembering it came from Bingo Bonnie's blogspot. Thank you Bingo Bonnie for this inspiration! I've lost track of her blog - but I STILL love this block. She calls it My Blue Heaven, not to be confused with Quiltville version of the same name, but slightly different. It's on my To-Do list -- isn't it the perfect scrap project? I have several baskets of 2 1/2 in. HSTs, knowing I can use them ... soon I hope. Very pretty quilt. Love the fact that it uses so many colors. What did you decide on the washer? Were you able to send it back? Love these, Elaine. I'd be interested in hearing how you set up and physically arrange your work for these scrappy quilts. I can imagine myself doing it and the whole room looking like an explosion in a fabric factory! Do you have any 'organizing while I sew' secrets?? I am especially loving the warm, earthy colors of that first pineapple quilt! Yes, I wanna know, too. Did you send your washer back? I really like your pineapple quilt. Your border design is great. My Blue Heaven is going to be a great scrappy quilt, too. Winner, winner! I hope that you made Hotpoint eat their washer! Your pineapple quilts are both lovely and oh my, so many pieces! The HST star block is fascinating, thank you for showing it. I love the scrappy look of it! Congratulations!! Your work is so gorgeous Elaine.. shame we don't live closer so I could have a detailed look..
marg... Elgin in the SW Corner of Western Australia..
For more info on Washing Machines.